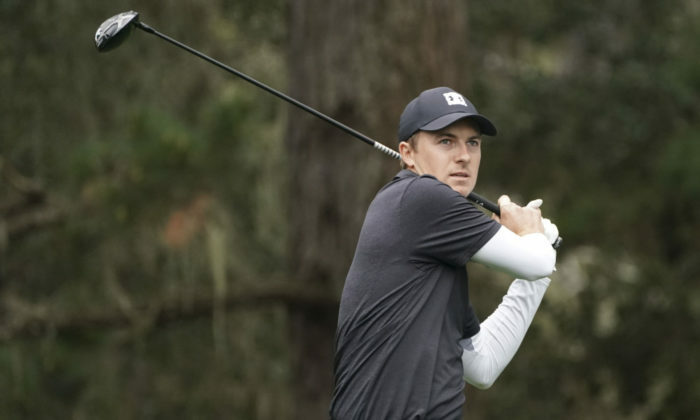 Phil Mickelson survived a wild finish and Jordan Spieth endured a wet finish to his day as they sat atop the leaderboard in the AT&T Pebble Beach Pro-Am, joined by Lucas Glover, Paul Casey and Scott Langley. Of the quartet, only Spieth has holes to finish after the second round was suspended because the rain had formed large puddles on the greens. Jason Day is one back of the leaders at -9 with three holes to play. One day after Mickelson didn’t miss a single fairway for the first time in 1,664 rounds on the PGA TOUR, he couldn’t seem to find even one at Spyglass Hill. He still managed to surge into the lead, including one 3-wood from 256 yards out of the trees on the par-5 14th to 6 feet. Mickelson was the first to finish at 10-under 133. Glover started strong in tame weather at Pebble Beach, and shot a 6-under 66 to get to 10-under 134, while Langley (69 at Spyglass Hill) and Casey (7-under 64 at Monterey Peninsula) narrowly finished at 10-under 133 ahead of the horn that ultimately stopped play for the rest of the day. Spieth was among 44 players who was due to return Saturday morning — weather permitting — to finish the last two holes of his round. Part of him was happy to be off the course, considering the fight he had on hand in cold, raw rain with increasing wind. Branden Grace, playing the Monterrey Peninsula course, is three back after a second round 69 that included four bogeys. Ernie Els finds himself just one behind his countryman after a bogey-free Friday as he signed for a 68 around Spyglass Hill.